Irish style celtic-punk from Brazilian band The McMiners. Yet another example of the international status of celtic-punk for you now with a great band hailing from Belo Horizonte in Brazil. It’s the sixth largest city in the country and in a country the size of Brazil that means its bigger than most counties over here! 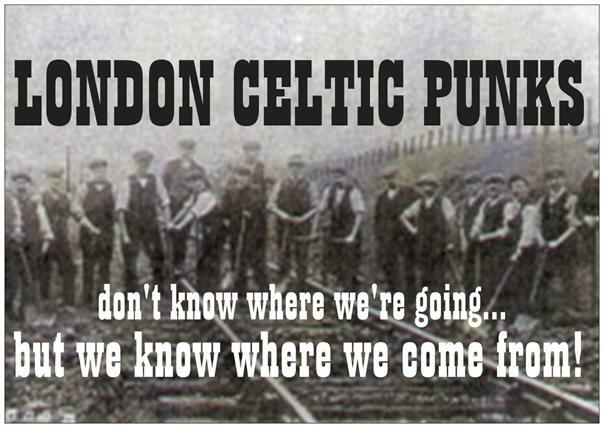 With over 2,500,000 in the city and over 5,000,000 in the surrounding area it stands to reason that their must be a bunch of celtic-punk fans with the talents to start a band and so in early 2012 The McMiners were born. The McMiners left to right: Luciano Alvim- tin Whistle, accordion, backing vocals * Nathan Augusto- electric and acoustic guitar, backing vocals * Nicolas Ramos- bagpipes * Gabriel Finnegan Leão- bass, bodhrán, mandolin, lead vocals * Marianna Gray- violin * Guilherme H. Silva- drums, percussion. Special Guests- (not pictured) special guests on the album: Karl Malachy Mooney and Rafael Salobreña. Whether or not the interest in celtic-punk is linked to any of this is debatable and it’s more likely the love of a good auld time and a few beers plays its part as well. It is safe to say though the Irish in South America are very proud of their roots and their history is one that should be known by all. The first McMiners release was the County Cross EP which came out in April last year. It has passed me by completely until I came to write this review so I revisited it and have to say I expected it to be a bit on the rough and ready side but it was actually very good. It’s four tracks included a extremely well played instrumental, a celtic-punk version of ‘Johnny I Hardly Knew You’ and a couple of their own compositions, one slow and a fast sea shanty that would befit any ship! So after having a couple of listens to that debut EP I sat down with a big mug of tea and a packet of biscuits to have a listen to their new release, Tales of Betrayal and Deceit. It’s taken a while to cross the oceans as it came out in April earlier this year but man am I glad that it did do! The EP kicks off with the instrumental ‘No Deal’ and if you were expecting something slow and traditional then you were as wrong as i was! It’s fast and manic and dominated by Nícolas great bagpipes. This is the kind of trad music to wake up the masses! In ‘Left Behind’ McMiners bring out both accordion and fiddle and the pace is still right up there. The lyrics speak of the poverty in their country and the ones left behind while obscene wealth is being made by some. The first release from the EP was ‘Behead The Captain’ for which they put out a great video and the pipes and fiddle are out again in force for this really catchy number. Great lyrics as they are throughout the EP with no sign whatsoever that English isn’t their first language. Like Lugh they sing in English and while this no doubt helps reviewers like me I really don’t think it matters. Ironically last week we reviewed the new album from London band The Babes where Mao the Singer/bagpiper sings several songs in Spanish! The next song ‘A Prologue / The Jack and the Black’ begins with the sound of the ocean and seagulls and Karl Mooney, accompanied only by a distant acoustic guitar, the Dublin born native and singer of fellow local celtic band The Celtas (here) reads a short piece about two brothers one of whom becomes a priest and the other a soldier before suddenly the band storm in kicking down the door and launch into a lovely big slice of celtic metal with chugging guitar and vocals that would put the fear of God into you. Again intelligent and interesting lyrics and an obvious step above the usual ones about drinking. The EP ends with another instrumental ‘The Clauss’ and while the opening instrumental was classic celtic-punk this is much more of a traditional Irish folk number. The song was originally an improvised session recorded on a phone with Luciano on tin Whistle and the band’s former piper Ernst on the accordion when Ernst left Brazil and moved to Ireland. Still close the band decided to record the song as a way to tell him they missed him. At the very end you can actually hear the original phone recording of the song! Two bodhráns are joined by accordion and tin whistle and shows the folk purist snobs that they can both play their instrument and write an exceptional traditional song too. Here is another band that Brazilians can be proud of and believe you and me a triumph of quality over quantity! Football, carnival, the Amazon, the ladies and samba music. Well add to that list celtic-punk as Brazil is coming for us!! Well who would have thought a Brazilian celtic-punk band? Well we would! For a start we loved their debut album ‘Quandos Os Canecos Batem’ so much it was voted in at #12 in the London Celtic Punks Best Of Poll of 2014. A short, fast and bombastic debut album that left all of us who heard it reeling. A great LP that has much in common with their recently released full lengther ‘Histórias Do Mar’. Formed in 2008 Lugh started off as a Bad Religion covers band but when they heard the Dropkick Murphys it was all to change suddenly. So it was with the addition of Leo, who had been playing accordion since he was five years old, and a set list of covers from our old friends, and yours, The Murphy’s and The Molly’s they began writing their own material. Before too long the new stuff outweighed the old and a new force in celtic-punk had been born. Hailing from Rio Grande Do Sul in the southernmost state in Brazil Lugh are following in the Brazilian celtic-punk footsteps of bands like Ketamina and The Leprachauns and there’s a small but thriving (and growing) celtic-punk scene in the country. As I have said ‘Histórias Do Mar’ has much in common with that debut album the main thing being the absolute speed at which Lugh plough through it. Ten songs in just over twenty five minutes with the average song lasting just a wee bit over two minutes. 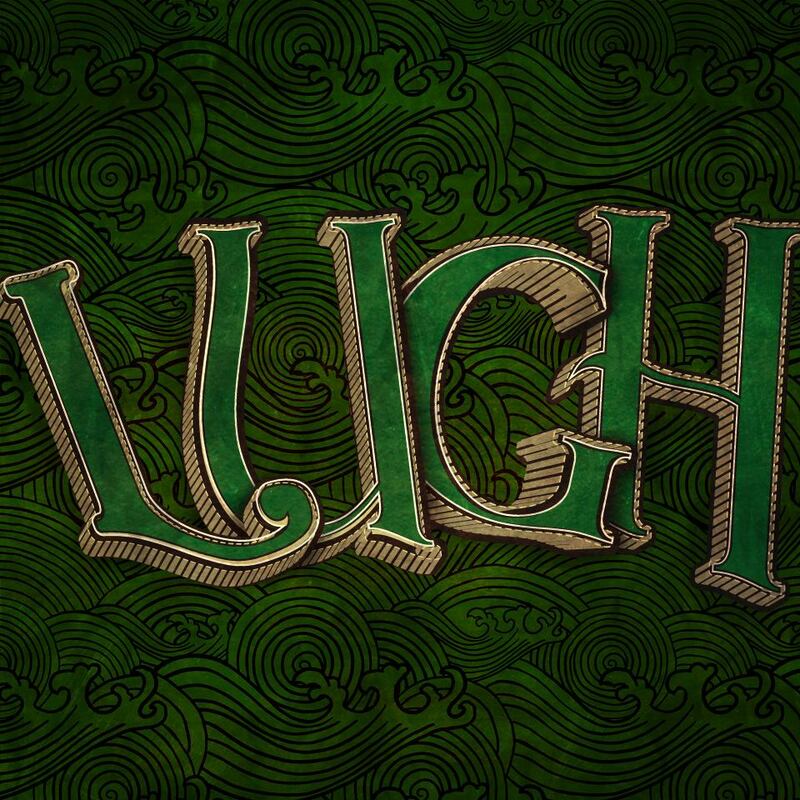 Lugh are very much on the Dropkick Murphys wing of celtic-punk and their folky punk rock blasts make a refreshing change at the moment as it seems to be that the folkier side of celtic-punk is in the ascendency at the moment. The album starts with ‘Marujo Perdido’ and the sound of an ocean and then the music jumps in and we’re away. Accordion led celtic-punk with the emphasis on punk is the best way I can describe it. I can’t add much more about the songs as Lugh sing entirely in Portuguese, the national language of Brazil. 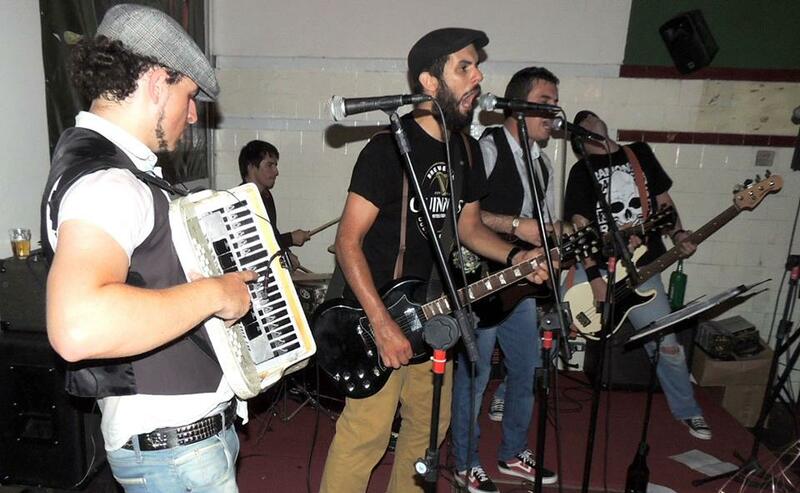 The various ten songs veer from straight forward celtic-punk with Latin influences to also influences from the likes of Rancid and Bad Religion as well as ska, metal or punky-country sounds like that of Social Distortion. Overall the length of the songs works perfectly for ‘Histórias Do Mar’ and even though it flies by so fast it never ever drags even on a slower (though not by much at all) track like ‘Nova Fase’. ‘Lutando em Vão’ and the final track ‘Todos por Um’ are probably my favourite tracks both with fantastic shouty vocals and pumped up electric guitar and some absolutely amazing accordion from Leo. With their original vocalist Biaque ‘Pincel’ Santos back at the microphone backed up by Daniel ‘Makako’ Jardim, Lucas Bala, George Polidoro and Leo, on that accordion,then one listen is enough to confirm that Lugh have delivered an album equally as good, if not better, than their debut. Lugh take their name from an Irish deity represented in mythology as a hero and an ancient High King honoured for his skills and gifts as a craftsman. Love and respect for Irish culture and Irish music shines through everything that Lugh do. In a time when its oh-so-trendy to bang on about ‘cultural appropriation’ I personally think its absolutely brilliant that bands like Lugh and others across the world take inspiration from the fights and lives and struggles and (occasional) wins and defeats of the Irish race. That my Grandad would still be around to see how across the globe how popular Irish music, and the Irish, has become would be as pleased as punch! * For an alternative view of the album go here and check out the review posted on the Celtic Folk Punk And More web-site. * There is an excellent Facebook group we can’t recommend enough so hightail it over to Irish Punk Brazil here and join the clan! A while back we reviewed the new album from The Sunday Punchers from South Africa and commented on them being the only celtic-punk band on their entire continent. Well they’re not quite as bad off as The Sunday Punchers but Lugh are almost in the same boat! They hail from Rio Grande Do Sul, the southernmost state in Brazil, and in the year of the Brazilian World Cup it seems appropriate to be reviewing their debut album on the day the World Cup begins. Their have been other Brazilian celtic bands before them, Ketamina and The Leprachauns for two, and there’s a thriving celtic-punk scene. Flogging Molly played last year to very enthusiastic sell-out crowds so hopefully this will lead to new bands as well as more interest in the existing local bands. The album itself is twelve tracks that last just over thirty minutes. At this point I gotta say I don’t speak an ounce of Portuguese so I am absolutely totally oblivious to what the lyrics are and so to what the songs are about. According to the band though their chief interests are pirates, weekends, friends and beer so not too dissimilar to any other celtic-punk bands. Now that’s globalization I can agree with for a change!! Lugh take their name from an Irish deity represented in mythology as a hero and an ancient High King honoured for his skills and gifts as a craftsman and that respect for Irish culture and Irish music pulses through everything that Lugh do. Back in 2008 the lads had a Bad Religion covers band on the go and when they heard the Dropkick’s ‘State Of Massachusetts’ that was it and they decided to go celtic. 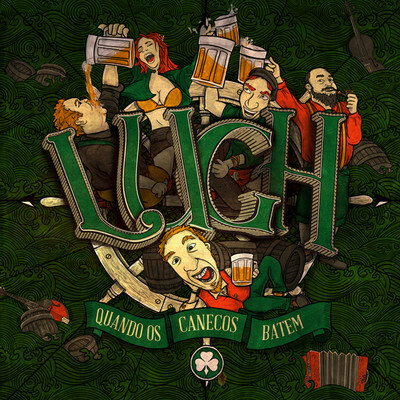 Lugh were then formed in 2009 with the addition of Leo, who had been playing accordion since he was five years old. Like most bands in the scene they started off doing mainly covers of our old friends, and yours, The Murphy’s and The Molly’s. Honing their skills they began to write their own material and before too long the new outweighed the old and a new force in celtic-punk had been born. As for the actual music Lugh are an absolute hidden treasure in the celtic-punk scene and hopefully this wee review will help somewhat to undo that. Extremely well played with the accordion to the fore and real pint in the air choruses. Musically I think they veer more to the DKM’s rather than FM or The Pogues and Lugh are very definitely a celtic-PUNK band. Strong vocal performances from the entire band help even though the words are a mystery! Stand out track ‘Chinaski’ though does have a bit of a Poguesy feel to it with the slow but extremely catchy tune and accordion. The rest of the album whizzes by and is a great rollicking romp through celtic-punk as played by a Brazilian band and all those extra influences they bring to the table. The whole album is a superb wee package and the artwork by Mateus De Castro is particularly good. Shades of punk, ska, reggae, Brazilian traditional folk, southern rock and, of course, celtic/Irish make this seriously one of the highlights of the year so far and in a year of such strong releases that is certainly saying something. at the moment you need to contact Lugh direct to get a copy of the CD. Message the band through their Facebook page here. there’s a fine review of the album by Celtic Folk Punk And More here. 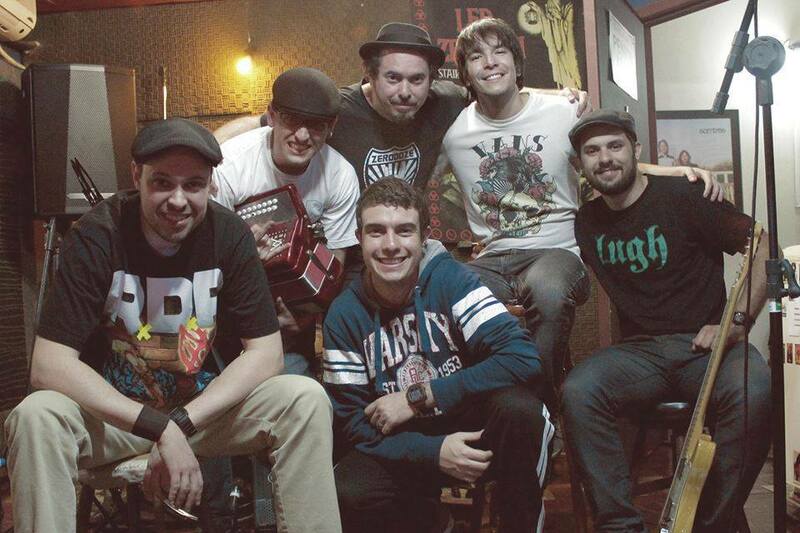 They’re a Spanish celtic-punk blog so they understood the lyrics a lot more than we did! There is an excellent facebook group we can’t recommend enough so hightail it over to Irish Punk Brazil here and join the clan!